14/02/2012 - The German economy recovered rapidly from the 2008-09 recession, with GDP topping pre-crisis rates during 2011 and unemployment falling significantly. According to the OECD’s latest Economic Survey of Germany presented today in Berlin by OECD Secretary-General Angel Gurría, Germany has an impressive economic track record, but now faces a cyclical return to slower growth rates and challenges to lay the foundations for long-term growth. The report cites numerous downside risks posed by the global slowdown, the deterioration of world trade and the euro area debt crisis. Given the weight and importance of Germany’s economy for Europe, growth-enhancing structural reforms can make an important contribution to stronger and more balanced growth perspectives not only in Germany but also in the Euro area. In a long-term perspective, Germany needs to transform its growth model to thrive as a knowledge-based economy. This transition requires policy efforts, investment and reforms in education, skills and innovation and continued leadership in green growth. But it also needs to work towards less burdensome regulations of services, increased labour participation of women and older workers and, thus, strengthening domestic demand. Germany should also compare itself with other economies in the emerging world, and be ready to compete with countries that have been growing at higher rates for quite some time now. The OECD says that it is essential that Germany allows automatic stabilisers to operate fully, as allowed under the new fiscal rule (Schuldenbremse). Reforms to further strengthen domestic demand should focus on improving the framework for investment and innovation in Germany’s domestic sector. This should include lowering the strict regulation in some service sectors, notably professional services, and improving support for innovation through creation of an R&D tax credit. Germany should seek to build on its outstanding recent employment performance -, which was the result of substantial labour market reforms and flexibility – by raising labour inputs to avoid skill shortages. Investing in skills, lowering fiscal disincentives to work for two-income households and further improving the supply of child care would encourage women to take up full-time work. Employment of older workers could be promoted and labour migration could be better focused on economic needs, which would require lowering the hurdles for high-skilled migrants. 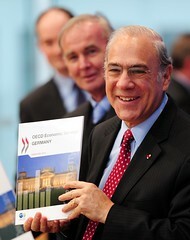 Angel Gurría,Secretary-General of the OECD at the presentation of the survey in Berlin, Germany. A chapter of the Survey notes that while Germany has been a leader in green growth for many years, its environmental policies must become more efficient to meet its ambitious targets for climate change mitigation at a reasonable cost. Eco-innovation should be fostered to maintain the lead on the green markets and develop new competitive sectors. Further information on the Economic Survey of Germany, is available at: www.oecd.org/eco/surveys/germany. You are invited to include this Internet link in coverage of the report. Journalists seeking further information should contact Antonie Kerwien, at the OECD’s Berlin Centre, (Antonie.Kerwien@oecd.org, +49 30 28 88 35 41) or the OECD Media Division: news.contact@oecd.org, +33 1 45 24 97 00.